Growing with 100 Watts of CFL (Compact Florescent Lighting) may not provide you with heaps of buds at the end of the grow, but should be more than enough for your own use for quite some time. Beyond that, the light output per watt of power consumed is excellent for 25 Watt (or thereabout) CFL bulbs. This translates to more light output – and therefore more marijuana output – per watt of energy put in. An energy efficient grow is not only environmentally friendly, it also keeps both the power bill down. Should you be concerned about drawing too much electric and therefore unwelcome attention to your grow, then this is the method for you. I’ll be posting pictures of the grow from seedlings to dried & cured buds, so stay tuned to this post. Want to know what this grow will cost in electricity? With 100 watts of lighting on 18 hours/day for 30 days (vegetative phase), you have 30 days x 1.8kWH = 54kWH. Flowering is only 12 hours a day, so 1.2kWH x (let’s say) 50 days for flowering = 60kWH. Even rounding up for fans and ventilation, total power consumption for lighting is about 120kWH. If you pay 25 cents per kilowatt hour, the electricity for this grow will cost you roughly $30 in electricity! That is not bad at all. The big question then becomes – How much dried and cured bud will I get out of a 100W grow? Follow this journal, and you’ll see first hand! 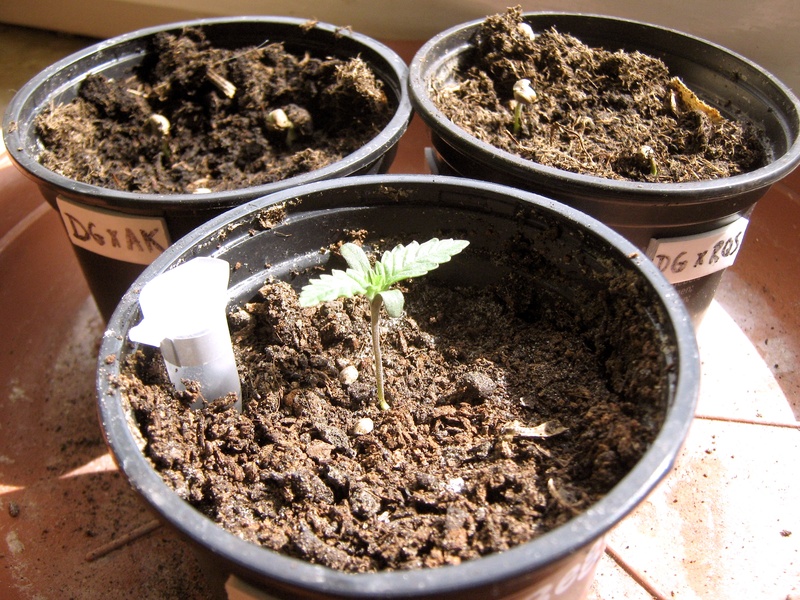 Today is Friday, August 9th, 2013 and the picture above shows a Dinafem Critical+ seedling (about 5 days old) in the foreground and several freshly sprouted (48 hours old) hybrid seeds from our own plants. There are two different hybrid crosses; labelled “DG x RQS” and “DG x AK”. The pollen for the cross was taken from a particularly virile male Double Gum (hence “DG”), and crossed with a beautiful female Afghan Kush and a Royal Queen Seeds “Royal Automatic” plant that had an impressively fat main bud.In both cases the seeds matured perfectly, and have so far sprouted 100%. I am a fan of Sensi’s “Double Gum”, and am excited to see how the traits of the different parent plants show up in the offspring. Other than the Critical+ from Dinafem (a free promo seed), these are not feminized seeds. This means thee will be some males, from which we may save pollen for further cross breeding. Most of the plants will require a change of lighting to go into flowering (not “auto” varieties). It is possible that some of the RQS x DG plants will auto-flower. Of course, they may turn out to be male as well! This variety of plant types will be perfect for showcasing how a 100 Watt grow – easy for any grower to set up – can turn out. The plants range from “likely to finish quickly” (RQS Royal Automatic genetics) to average flowering time (Indica-heavy Double Gum x Afghan Kush) to the very Sativa “Critical+”, which will finish last. I gave the Critical+ a few days head start, since I will be topping it to keep it’s height under control. Stay tuned to see how vegetative growth goes. I will be dedicating the blog to this series of posts for the next few months – from seed to flowering, harvest, and drying/curing. If veg growth goes as planned, I will switch to the flowering phase by the end of September. Harvest should be in late October (a couple weeks later for the Critical+ plant), provided that the hybrid varieties show more of their Indica genes rather than their Sativa heritage. If budding is still in full swing, we’ll let them fatten up, and see what kind of yield these provide under a very budget-minded 100 Watts of light! 100W CFL is a sufficient option, but I think 42 W bulbs are more efficient and T5 light are even more efficient in producing lumens per watt of electricity! In my opinion 100W is a bit too low and for the same amount of electricity you could get 30 to 40 % more light if you use T5 fluorescent lights. Thanks again for writing, Midowo. The goal of this “grow project” is to show what can be done with CFL bulbs at around 100 Watts, for those readers who really want to grow on a shoestring budget. These bulbs cost under $20, whereas a T5 lighting fixture and bulbs will cost quite a bit more. Naturally, anyone who wants to up the ante can add more bulbs, or use a different lighting altogether! We’ll see how 100 Watts CFL turns out 😉 Stay tuned! Tnx for the quick comments and explaining what was the intent of this post!! What kind of “color ” does the lamps have? More red, blue? Something in between? Using CFL 6500k for growth, 2700k for flowering. I’m a big fan of any kind of fluorescent light for home growing. There are a lot of people out there who say you need this or that to grow good cannabis, but it is a lot of hype and a big waste of money. It doesn’t matter what kind of fancy crap you buy, it won’t make you a better grower! 100 total Watts or consumed? Or better yet maybe,how many lights and how many true Watts?